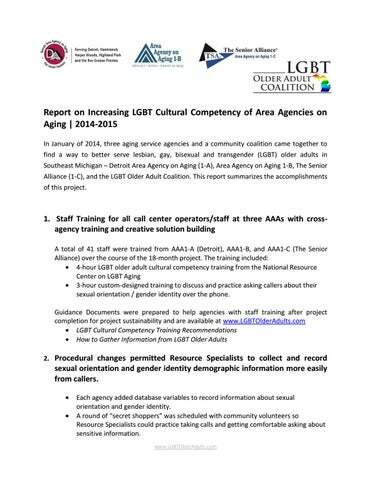 Report on Increasing LGBT Cultural Competency of Area Agencies on Aging | 2014-2015 In January of 2014, three aging service agencies and a community coalition came together to find a way to better serve lesbian, gay, bisexual and transgender (LGBT) older adults in Southeast Michigan – Detroit Area Agency on Aging (1-A), Area Agency on Aging 1-B, The Senior Alliance (1-C), and the LGBT Older Adult Coalition. This report summarizes the accomplishments of this project. 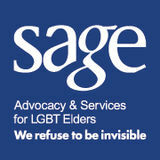 Creative approaches for letting callers know about LGBT-affirming resources were developed. One best practice identified: add “we’ve recently added LGBT referrals to our resources” to automated hold-message for each agency.